While smart-gun technology has been in development for nearly two decades, research efforts have most often stalled because of a lack of funding. When the technology has come to market, it has at times been met by vehement pushback from gun rights groups that fear any adoption could lead to new local or national laws. Even Silicon Valley tech firms have been reluctant to join in on the political battlefront, Hirsch said. "We desperately need capital investment, and the technology community is not stepping up," Hirsch said. Mossberg said the lack of funding is not as much a matter of tech firms avoiding the smart gun political brouhaha but more about a lack of outreach to that community. Virtually every smart gun developer, however, is familiar with a 14-year-old New Jersey law that ignited the anti-smartgun firestorm. The 2002 so-called New Jersey Smart Gun Law, authored by State Senate majority leader Loretta Weinberg (D-Bergen), requires every firearms dealer to sell only smart guns, starting three years after they are available on the market. "It was the classic example of government overstepping its boundaries, thinking it's smarter than the people -- and it had the opposite effect of what it was supposed to do," Mossberg said. "These things have a way of backfiring." This caused a backlash against smart guns, not just in New Jersey but nationwide. According to David Kopel, a policy analyst at the Cato Institute, New Jersey’s mandate may have been intended to force a market for smart guns, but as soon as just one is sold, it would trigger a ban on all other, traditional firearms. “So who would want to sell a smart gun knowing that, by doing so, they'd be imposing a handgun ban on New Jersey?" he told NPR in a June 2014 interview. In 2014 and 2015 Weinberg said she would repeal the Smart Gun Law if, after doing so, the National Rifle Associate (NRA) would agree not to impede smart gun development and sales. According to a spokesperson for Sen. Weinberg, the NRA never responded to her offer. This year, Sen. Weinberg sponsored another bill (S816) passed by the House and Senate that would have repealed and replaced the Smart Gun Law with a watered-down mandate requiring gun stores to carry at least one smart gun model. On Sept. 8, New Jersey Gov. Chris Christie conditionally vetoed S816, stating he would support the legislation only if it also relaxed laws on who can carry a handgun. New Jersey is not along in its smart-gun legislative efforts. In 2014, Sen. Edward Markey (D-Mass) introduced the Handgun Trigger Safety Act, which also would have required all handguns manufactured, sold or imported into the United States to incorporate smart-gun technology within three years of the law being enacted. Earlier this year, President Barack Obama called for smart gun R&D funding and opened up the U.S. government as a potential market for its adoption. Obama directed the Defense Department, the Justice Department and the Department of Homeland Security to conduct or sponsor research into gun safety technology. He also instructed the departments to "review the availability of smart-gun technology on a regular basis, and to explore potential ways to further its use and development to more broadly improve gun safety." Smart-gun proponents who have been developing the technology or lobbied the federal government in the past for funding applauded the move, saying it's the only way to move the technology to market. But pushback continues. 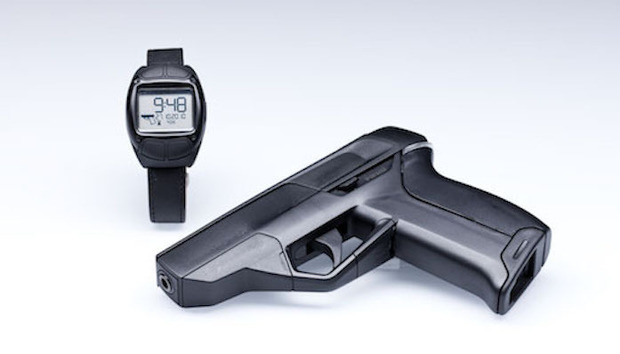 Last year, Germany-based Armatix attempted to sell the first smart gun in the U.S. Its .22-caliber iP1 pistol debuted in one of California's largest gun stores. But it was quickly pulled from the shelves after some gun advocates pressured the store to stop selling the gun. Engage Armament, a Maryland gun store, also announced it would sell the iP1, but reneged after gun-rights advocates allegedly lashed out on social media, called the store and even threatened its owner. Gun advocacy groups such as the NRA and the National Shooting Sports Foundation (NSSA) have said they do not oppose smart-gun technology. The NSSA said market forces should decide whether smart gun technology is adopted and noted it has never opposed its development. "We would continue to oppose mandates for this technology, particularly since there are well-proven existing methods to secure firearms, and firearms accidents are at historic low levels," an NSSA statement read. Mossberg, Kloepfer and Hirsch all vehemently oppose smartgun laws. Mossberg's iGun Technology website states: "NO MANDATES." "We are working on plans to introduce this product to select markets, but will do so only in a free-market environment," the website's marketing material declares. Hirsch believes only a free market for smart guns will allow them to flourish. "But, we need to get these things to market. I think as far as the gun-owning community, there will be some who will never, ever want to adopt this. That's fine. If you don't' like them, don't buy the technology," Hirsch said. "But don't stop me as a gun owner from being able to buy this technology."